Drawing was the last step of the manufacture process, in which a wire was looped through each hole, a bunch of bristle inserted into the loop, doubled, and finally pulled tightly into the bristle hole. Pictured at left is woman in her kitchen, hand drawing toothbrushes, ca. 1912. The process of hand drawing bristles was most often ‘home work,’ done by working class, urban women, who were paid per brush or dozen brushes. Though brushmaking became a more common trade in the 19th century, it remained a largely hand-made process; machines like this remained rare. Thomas Jesson, Improvement in Brush-Making Machines. United States Patent and Trademark Office, September 11, 1877. Improvements in manufacturing techniques were common, however, they rarely caught on for most manufacturers. 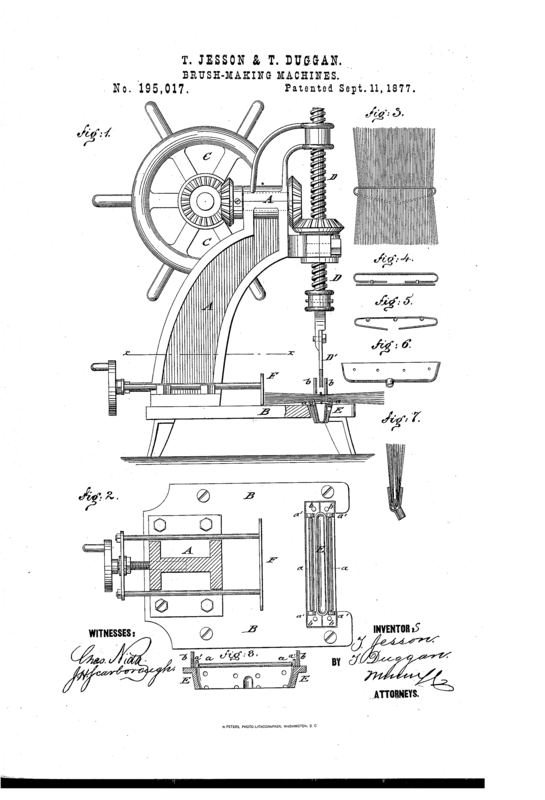 An 1877 machine patent by Thomas Jesson used technology and technique similar to a sewing machine to draw bristles. [right] However, these machines could still only produce one brush at a time. The process of hand drawing was quick, and as the workers were women, they provided cheap labor. Machines like this one, therefore, were rare in the factory; their expense did not outweigh their advantages. Mechanization of toothbrush manufacture took place on a large scale in the 1930s with the development of synthetic materials.